Mark 8:34 And he called to him the multitude with his disciples, and said to them, “If any man would come after me, let him deny himself and take up his cross and follow me. I love the Gospel of Mark, it encourages me to ask questions and this verse in his gospel is one of those that drives me crazy with questions. The reason is I’m not sure whose cross I’m supposed to carry. If I take it literally, which is how it is most often interpreted, then I am to bear “my” cross and follow Jesus. But If I look at this scripture from the way Jesus responded to all of those who did follow him and surrounded him as he taught, then, this verse takes on new meaning for me. First of all these words of Jesus are recorded in all three of the synoptic Gospels, but not in John. Now it could be that Matthew and Luke simply copied Mark, after all they used Mark as their blueprint for their own Gospels. But, the fact that it appears almost word for word in each of three synoptic Gospels leads me to believe this was something Jesus did say or could have said. Jesus also never said anything that would contradict what he “did” throughout his life of a servant to the disadvantaged, displaced, ill, elderly and disabled. Jesus’ life as it was recorded in the synoptic Gospels was less about what he said and all about what he did. It is also one of the verses that is almost always misused or misquoted to, or by, those who are having a difficult time. How often have you heard the words “well that is my (your) cross to bear.” Something about that phrase has always bothered me. It’s used to trivialize suffering or difficult times for people and I think that is wrong. I don’t believe that Jesus would have ever told anyone that and I believe the “traditional” interpretation of this verse of carrying my own cross may not be what Jesus had in mind when he called to his disciples and the multitude. Jesus always cared for those who could not care for themselves. His ministry was to those who had been discarded by society, bringing them back into relationship with their communities and with God. We often see him tired and totally worn out from giving of himself to those who needed him. And my question is; is that not carrying the cross of the other long? In fact we see death in so many ways in the ministry of Jesus, and not just Lazarus (John 11:41-43), a widow’s son (Luke 7:14), or Jairus’ little girl (Matthew 9:25, Mark 5:41, Luke 8:54). We see those who are dead and buried simply because they don’t fit society’s profile of “normal,” the blind, the infirm, and the mentally disabled and we see them resurrected from their death to life by Jesus who returns them to their communities. Every story of healing is a story of death and resurrection and it is Jesus who takes the burdens, i.e. 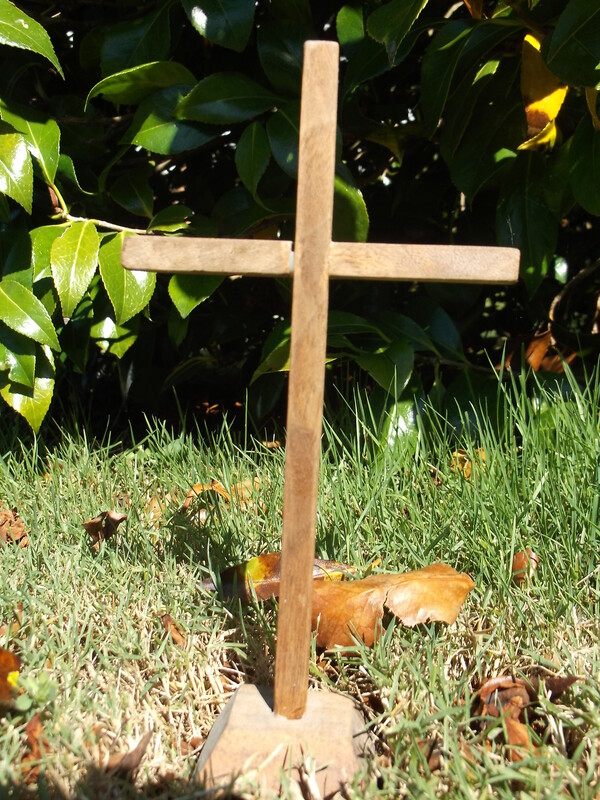 their crosses, of those who have died to life restoring them to family and community. Jesus was teaching a Way of Life, and, one in which we as his followers were to emulate. That means caring for those who have died to society, bringing them back to life by restoring them to God, their families, and their communities. If we are going to be followers of Jesus then it is not our salvation that we are to be concerned with. No, it is the resurrection and life of those who have been pushed outside of society and left to die to life. Now don’t get me wrong, I don’t believe the way I reach God is the only way. I believe there are many paths to God and each person will find their own path in their own good way and time. But If I am carrying the cross of those who are disadvantaged than I do it in the name of my faith in Jesus and give the space for those who are in my care to find the best way forward in their own way. To relieve the suffering of others, carrying their cross, is enough for my task. I can’t make the decisions as to how the move forward for them that is their choice. It could be that they choose to refuse my help and that is OK, they then have chosen to remain where they are in their spiritual lives. So carrying the cross of someone else means opening a door for them, or clearing a pathway that allows them to return to a right relationship with God, no matter what that may look like for any particular individual. It means walking along side someone supporting their burdens while they sort out their lives and relationship with God no matter how they worship, or name God. Not an easy task for sure. We can see the effects on Jesus throughout scripture in his perpetual fatigue. Yet Jesus never complained and that too is a goal we are to reach for and it too is very difficult. Now the next question is, if I am carrying someone else’s cross who is carrying mine. And that’s a tricky question. Do you remember that during the trip to Golgotha Simon of Cyrene (Matthew 27: 32, Mark 15:21, Luke 23:26) was conscripted into carrying Jesus cross? This, for means me, Simon supported Jesus’ burdens and Jesus was now the one who was in need of life. Jesus find life in his own resurrection, a resurrection had had given to so many others throughout his lifetime. My lesson of the scripture is someone else is walking with me and supporting my burdens while I support the burdens of those who are disadvantaged. The person supporting my burdens is Jesus and I am supporting Jesus’ burdens in my walking in the way He taught. Now that is a big cross to carry! I am not sure I know how to fulfill this task, but I do know that I’m not alone; in fact I am never alone. I have others on the same pathway and I always have the presence of Christ and the Holy Spirit to hold me up and cheer me on. I am not perfect at following the teaching of Jesus but grateful that He’s not too picky and forgives me my all too often mistakes and stumbles. While I strive to be Jesus like I often miss the mark and that means I’m not always helpful. All I am asked to do is to keep trying and moving forward on the path. I mean after all he taught those 12 male disciples and they never got it right so I figure I’m in good company. Life is what I want, for me and for all that I meet. It’s not my job or task to determine what that life will look like for someone else, I only need to worry about what mine looks like. That is sufficient unto the day. All Christ, God, and Holy Spirit want is for me to try, that’s all, and I am forgive my wanderings from the path and am welcomed back when I find it again. That is all I can do, that is all any of us can do. May your journey be a joyful one, but if it’s not then I pray that you let someone support you and help you back into life. Ruth, you made me think about translating again today! Note: Jesus is talking and has no problem saying follow ME in the quote. So him could be the God him. Or the brother him or the sister him or the child him. I also think it is interesting to think of “taking up the cross” when the cross incident has not occurred yet. What would that mean to a people who don’t know that Jesus is crucified? You know, maybe in the whole process of letting people find their own way to God they learn how to serve, taking up the cross in Christian language, in a way consistent with their pathways. All I can do is be the best model for my own path and let that speak for itself. It puts a lot of responsibility on me, or us, to react, respond, behave in a way consistent with what Jesus taught and that isn’t easy. I have to accept that I won’t always be that model because I’m not as good at it as my model, How other faiths see actions will depend on how well I model them and on how they view their own faiths. There really is nothing I can do about that, but let it go and leave it up to God. Oh…and I’m not arguing your interpretation, just offering weird observations that may enhance your p.o.v. I know. One of the reason I post is so other can chime in and add or debate me. That is the way of theological discussion my Greeky, geeky, bible nerdy friend and I love it when you add your bit.